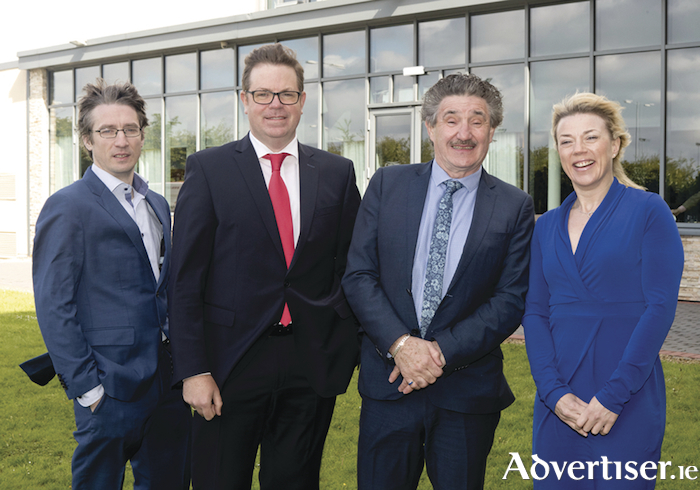 Pictured at the announcement of funding for the MET Gateway Network, (l-r): Tomás Thompson, CEO Rockfield Medical (based in the GMIT iHub); Dr Eugene McCarthy, GMIT MET Gateway; Minister of State for Training and Skills John Halligan; and Dr Lisa Ryan, GMIT MET academic director in medicinal nutrition. GMIT’s Medical and Engineering Technologies (MET ) Gateway is to receive €1.4m Government funding over the next five years to provide cutting-edge, industry focused, solutions for SMEs and larger organisations across the MedTech, engineering, and life sciences sectors. GMIT’s MET Gateway is one of 15 industry-focused Enterprise Ireland technology gateways, located in 11 institutes of technology and comprising 300 highly skilled and industrially focused researchers, together with specialist equipment and facilities. The five-year programme represents a €26.75m Government investment in the Enterprise Ireland Technology Gateway Network from 2018 to 2022 to deliver technology-based solutions for industry. Since its formation in 2013, the Technology Gateway Network has completed some 2,750 innovative projects with more than 1,250 Irish based companies. Projects range from polymers to pharmaceuticals, photonics to mobile services and mechatronics, right through to biotechnology and industrial design. Typical projects focus on the development of a new product or service or the optimisation of a process, across all sectors of the economy and based in every county. Announcing the funding, the Minister of State for Training and Skills, John Halligan, said: “The Technology Gateway Network programme aims to bring Irish companies together with the researchers in the institutes of technology to provide near-to-market innovation and solutions in a range of areas, both regionally and nationally.